When discussing French wines, mention Bordeaux and often the conversation turns to the stellar prices of top Chateaus. Burgundy, the same. And wine drinkers that favor the old world style of wines may be familiar with Sancerre and Vouvray wines from the Loire Valley in France. Everyone knows Champagne, even if they drink only sparkling wine. And the Rhone Valley? Who hasn’t enjoyed a Cote du Rhone? Along with such French wines that can command amazing prices, are wines that are very enjoyable, also from France, and offer the unique taste and style of the region – and are amazingly affordable. And without having to become a Master of Wine, or a Certified Sommelier, you can easily find bargains in the Loire, the Rhone and the Languedoc. 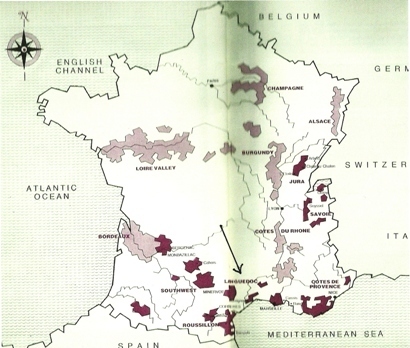 The Languedoc, so unfortunately, is the least known of these areas, but the area of the white wine we’re talking about today, and one you don’t want to miss. mestic varieties of that region. The grape exists in both dark skinned (Picpoul noir) and light skinned (Picpoul blanc) versions and the little grown Picpoul gris. Picpoul blanc is the most common. Picpoul de Pinet is a designation for white wines made exclusively from Picpoul blanc grapes within the Languedoc, and specifically within the region of Pinet. Picpoul de Pinet wines are well on their way to being recognized with their own AOC, given that the vineyards sit on top of a limestone plateau and enjoy unique conditions and the cooling breezes of the Mediterranean..
What should you expect from these wines? A delicious crispness; refreshing minerality that is balanced with aromas and taste of citrus and lemon, apricots, yellow plums and green apple. As with other whites, these wines go well with seafood, especially oysters and mussels but can also be delicious with cheeses and cured meats on a charcuterie. These are versatile food wines; their acidity neutralizes the iodine in shellfish and cleanses the mouth after eating fatty cheeses and meats. With some, there is a slight herbal complexity to the finish, but generally these are not complex wines nor are they wines to age. Recently, I poured several wines at a retail store and a customer asked me to describe one of the wines she wanted to taste: a Graffigna Pinot Grigio from Chile, (and nicely priced at $9.99 U.S.). I provided the usual information but went on to say that life needn’t be complicated; that it was a simple, happy wine. Chill it, sit on the deck or the patio, listen to some tunes, and enjoy the blue sky and the bird songs. Take it on a picnic, hopefully near some water and savor the gift and beauty of a nice day. Picpoul is like that, but perhaps something new for you and exciting. Personally, I find it more versatile. The bottle pictured sells commonly for $9 and is occasionally on sale for less. You could spend more, but why would you want to?